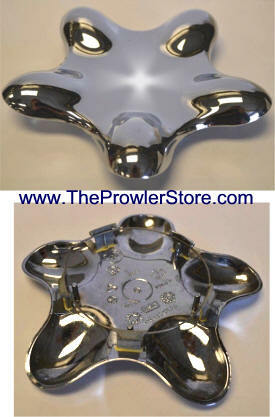 Brighten up your Prowlers beautiful Chrome wheels with these four Wheel Rotor Covers. 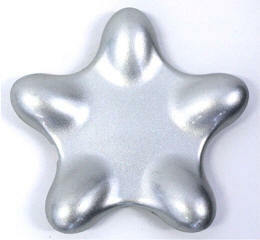 Each one is highly polished stainless steel and enhances the reflection and appearance of your chrome wheels. Discs are 9.5 inch diameters. Presents a clean reflective appearance you will love! One per each of your four wheels. Easy to install simply take off wheel and the cover easily slides on over your rotor. Does not effect braking performance. Will not rust, corrode or ever lose their luster. 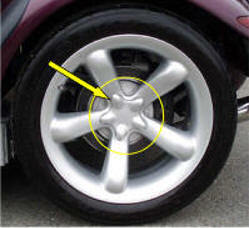 NOTE: Due the design of the inner wheel barrel of the Front Wheels this part is not possible. 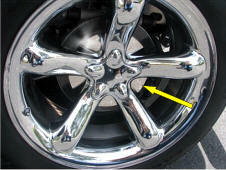 appearance of the bright chrome wheels. 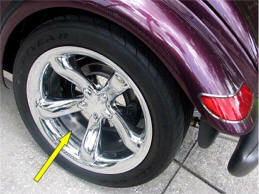 "Save your expensive Rear Wheels"
Brighten up your Prowlers beautiful Chrome wheels with these two Wheel Saver Covers. 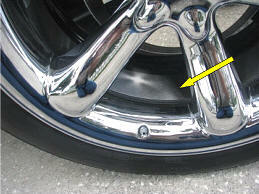 Covers the area where your rear wheels start to bubble, pit and rust to keep your wheels looking great much longer. 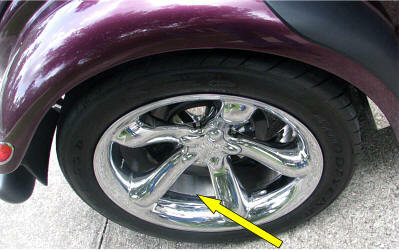 Each one is brushed polished stainless steel and enhances the reflection and appearance of your chrome wheels. 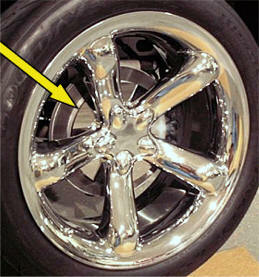 A reflective appearance that forms the finishing touch to your chrome wheels that you will love! One per wheel. 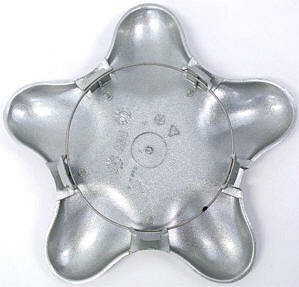 Easy to install simply take off wheel and the cover easily slides around inside your wheel. Easy peel and stick applications. Does not effect wheel balance or performance. Wheel Saver bands are 2 5/8" wide about as wide as the inner wheel. NOTE: Sorry, do to the design of the inner wheel barrel of the front wheel it is not possible to offer this product for the front wheels. 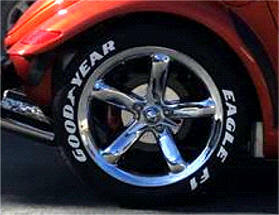 TW-WHTLET4 Plymouth Prowler 'White Letters' for your tires. 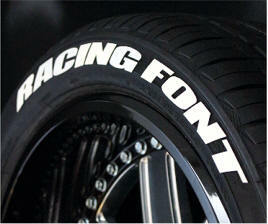 1 inch and 3/4 inch White Letters for you tires. 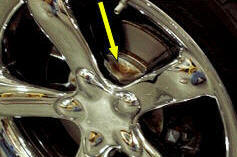 Clean tire thoroughly, and glue each letter on to the wall of the tire. Glue and individual letters included. Spell whatever you want! Once mounted correctly - Customers have told us they last the life of their tires. Spell out the letters you want. 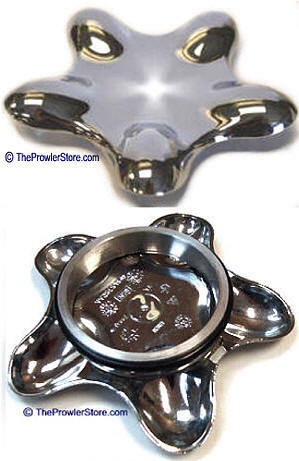 The "flower petal" Chrome center wheel cap. Fits all four wheels. Brand new Factory original part. Simply snaps in. Item contains one (1) new Prowler wheel center cap. Buy one for a spare before we run out and no more will be made. Plymouth Prowler 97-02 Chrome Wheel Cap with Heavy DUTY snap on Fit! The original cap fit loosens over time and cause the cap to fall off while you are driving. 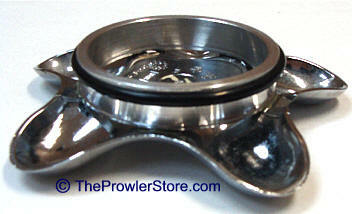 This is a brand new Factory original part modified to include a heavy duty sturdy snap fit. Once mounted looks the same as regular fit. Simply snaps in. 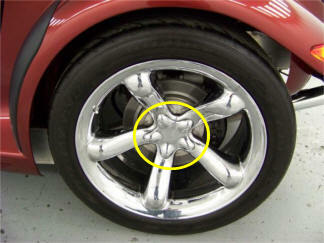 Item contains one (1) new Prowler wheel center cap modified for Heavy DUTY fit.. Heavy DUTY push on Fit! convert to a Heavy DUTY snap on Fit! Will Never weaken! Send us your Prowler wheel caps with the broken tabs. We will rebuild them and convert them to the Heavy Duty fit cap with a metal ring mount and send them back to you. Will never weaken. STOP losing your wheel Caps! Broken mounting tabs? Replace them with a heavy metal ring mount. 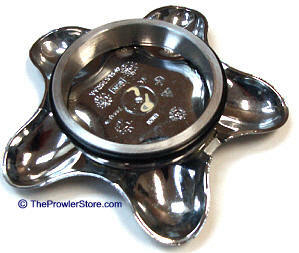 The "flower petal" Silver center wheel cap. Fits all four wheels. Buy one for a spare before Chrysler stops making them.